Posted November 13th, 2014 at 10:34 am. 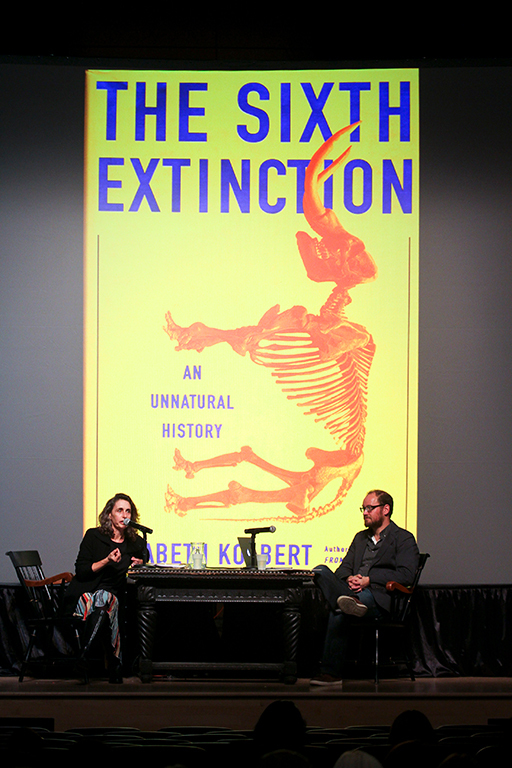 Elizabeth Kolbert, author of The Sixth Extinction: An Unnatural History, visited campus on Monday, Nov. 10 for a special talk and book signing especially for members of the Class of 2018. Kolbert came to campus as part of the The Emily Balch Speaker Series. Linked to the Emily Balch Seminars, past speakers have included Alison Bechdel, Karen Russell, and Zadie Smith. Kolbert appeared on the stage of Goodhart Theater, where Creative Writing Program Director Daniel Torday asked her questions about passages from The Sixth Extiction, which was recently named one of the Library Journal‘s ten best books of 2014. In addition, Kolbert read from passages, shared exclusive photographs from her research trips, and answered questions from students. After the Q&A, Kolbert joined the students in Thomas Great Hall for a dessert reception and book signing. Emily Balch seminars are discussion-oriented, reading- and writing-intensive courses for first-year Bryn Mawr students. Taught by scholar/teachers of distinction within their fields and across academic disciplines, Balch Seminars challenge students to think about complex, wide-ranging issues from a variety of perspectives. For more information, visit the Balch website. Funding for Kolbert’s presentation was made possible by the Roberta Holder Gellert Symposium Fund.